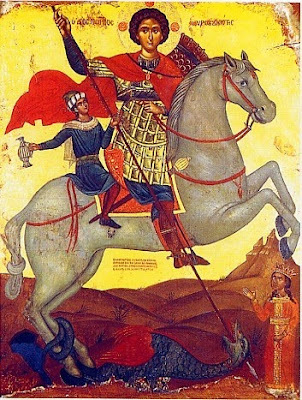 Historically, the status of St. George as a dragonslayer did not come about till the eleventh century, and no such reference to it can be found any earlier (the earliest image we know comes from 11th century Cappadocia and the earliest narrative we have comes from 11th century Georgia). According to Maria Vasilakis, who is an Associate Professor of Byzantine Art: "The eminent holy dragonslayers in the Eastern Church were the two Theodore's, the Recruit and the General. The earliest representation of George from the sixth century shows him as an official rather than in a military uniform. I know of no representations from the ninth century. However, only in the eleventh century does he appear as a dragonslayer. How and why George replaced the two Theodore's is uncertain." 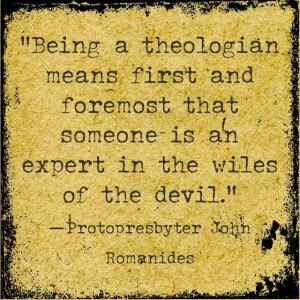 It should be added that there are other dragonslaying saints in the Orthodox Church, and sometimes the dragon is replaced with a snake or a crocodile or some other wild beast. Ancient Greek mythology also makes reference to dragonslaying heroes, such as Hercules, Perseus and even Apollo who killed the python. The allegorical legend of St. George the Dragonslayer could be a way to show St. George as a hero, since by the eleventh century he was a very popular model and example for all the martyrs and saints of the Church who suffered for Jesus Christ against tyrants, empires, heresies, ideologies, theories, etc. Within all of us is a hero who sometimes needs to battle against a reptilian shadow to become light and free the daughter, who could be an image of the soul. Furthermore, the name "George" comes from the noun γεώργιον which denotes a farm or a cultivated field. This could be an epithet for a person who is going through spiritual cultivation. In hymnography St. George is called the "cultivator of Christ". St. George as a horseman and dragonslayer is related to water and wells. And the deprivation of water in the summer months, especially if it doesn't rain during the winter, could be a source of great suffering in places like Greece, Asia Minor and the Middle East. The dragon who breathes flames from his mouth is keeping the water of the area hostage - as the tale says - and it will not allow it to flow unless the princess is sacrificed to the dragon. Therefore, St. George slays the dragon and saves the princess. Some would argue that the princess in the icon merely depicts Empress Alexandra, the wife of Diocletian, who converted to Christianity upon witnessing the sufferings of St. George and was martyred with him. Her image in icons with St. George could have inspired the later symbolic imagery and the narrative of St. George slaying the dragon to save the princess. The dragon also symbolizes the wicked serpent, the devil, as we read in Revelation 12:9. The battle against the dragon could indicate the spiritual battle against the devil and evil for the salvation of the soul. The fear of the dragon is the lack of faith and ignorance. If these are eliminated then the dragon has no power. The image of St. George as a dragonslayer did not appear in Greece until the fourteenth century, and this may have something to do with the Ottoman takeover of Epirus and Albania. In Byzantium, however, there is another evolution. The sixth century image of St. George as an official or soldier shows Byzantium confident, certain and secure in its power, and the Church has a strong role in the Empire. A few centuries later St. George is depicted on horseback with a spear, and this is a time of Islamic invasions, Iconoclasm and the distancing of the West. Later, in the eleventh century, Byzantium is in an even more difficult position, with many enemies around them and threatening them, and this is when we find St. George as a dragonslayer. Byzantium needs a powerful ally, who has divine power and presence. St. George at this time is established as the protector of soldiers, together with other military saints, like Sts. Theodore the Recruit and Theodore the General. In light of this, we also have the Byzantine epic poem, Digenes Akritas, which features a heroic frontier military leader named Basil on the eastern frontier of the empire after the Byzantine resurgence of the 9th and 10th centuries. As the empire reconquered territory lost to the Arabs centuries ago, the eastern frontier of the empire remained under the control of the military aristocracy, of which Basil was a member. As a work of literature, the poem’s protagonist represents certain ideals of the society that produced it, especially ideals of masculinity and gender that were reproduced in the daily lives of the people sharing that cultural background. As a product of a deeply Christian medieval empire, the ideals of masculinity depicted in the poem are deeply influenced by Christianity, chivalry, ancient Greek traditions, and the cultural values of Byzantine elites. The ideals of masculinity presented in the poem are primarily influenced by Christian values and monasticism. The source of the protagonist’s power lies in “having as help the grace of God.” Following the warrior saint traditions of famous historical figures, such as George, Theodore and Demetrios, who are invoked by the hero in the poem, they provide the foundations of many of Basil’s superhuman exploits. Like some of the warrior saints of the past, Basil slays a dragon, which, like the serpent in the Garden of Eden, endeavors to tempt Basil’s wife. Like the victorious St. George does in his tale, Basil beheads the three-headed dragon, thereby demonstrating his piety and self-control in the face of desire. In addition, Basil’s love of hunting wild animals and killing lions with his bare hands symbolizes a catharsis for the hero since wild animals symbolize lack of self-control and an inclination to passion. In addition to hunting and dragonslaying symbolism, Basil also displays piety, kindness, mercy, and humility in his interactions with others. Therefore, the ideal man of the Roman/Byzantine world would be devoutly Christian, humble, pious, and in control of his body and emotions. 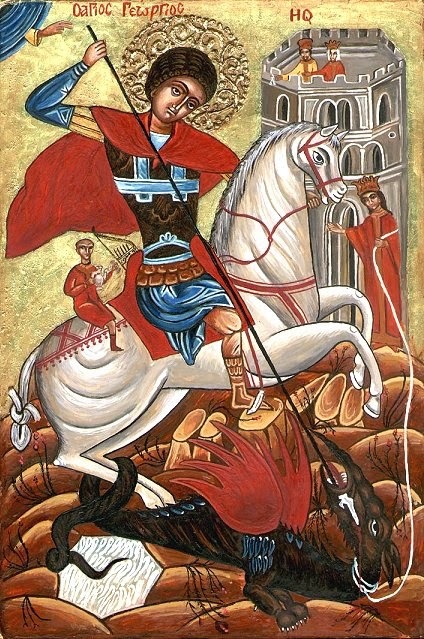 The depiction of St. George as a dragonslayer at the time it appeared and the corresponding rise of the epic of Digenes Akritas could be key indicators in how the icon of St. George as a dragonslayer is interpreted. And these reasons could be why the Crusaders brought this imagery and expanded on this tale in the West. Lastly, often in icons of St. George slaying the dragon we see an image of a child on the horse with St. George. This comes from a miracle of St. George in which it is said that a young boy from Mytilene fell victim to the Hagarenes. The Saint speedily appeared on horseback and rescued the boy as he was serving wine to his master by grabbing him, putting him on the horse, and delivering him to his parents. In other icons we see the princess holding the dragon with a string, because according to the legend the Saint calmed the dragon through his prayers and the princess dragged it and tied it to the city walls, so all the people could watch the scene. These depictions add to the fact that St. George is a speedy helper and deliverer in time of need for all those who call upon him with faith.